Love this print! 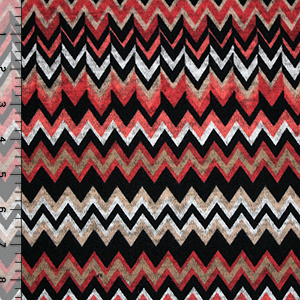 Colors of coral orange and pink, taupe, and black with arrows and chevron design on a heather gray Hacci sweater knit. Fabric is light to medium weight, a tighter jersey style weave, nice drape, and a good 4 way stretch and recovery. Pattern repeat measures 14 3/4".